ATLANTA, August 21, 2018 – OrthoAtlanta is proud to serve Atlanta’s Major League Soccer (MLS) team, Atlanta United FC, and Atlanta United 2 providing medical care, including orthopedic and sports medicine care. OrthoAtlanta orthopedic surgeon, Peter J. Symbas, M.D., serves as Chief Medical Officer for Atlanta United FC. Jeffrey P. Smith, M.D., OrthoAtlanta foot and ankle surgeon, provides orthopedic and sports medicine care to Atlanta United 2. OrthoAtlanta physicians serve Atlanta’s professional soccer teams in collaboration with the Piedmont Healthcare role as the Official Adult Healthcare Partner of Atlanta United. OrthoAtlanta Orthopedic and Sports Medicine Specialists are one of the largest physician-owned orthopedic and sports medicine practices in Atlanta with 39 physicians and 14 offices across the greater Atlanta metropolitan area. As Chief Medical Officer, Atlanta United FC, OrthoAtlanta orthopedic surgeon, Peter J. Symbas, MD, oversees a consortium of orthopedic and sports medicine physicians that provide medical services as needed to the Atlanta United players, coaches and staff during all home games. Dr. Symbas said, “Soccer has been my passion since youth, driving me to pursue a career in sports medicine. I am extremely proud to serve as the chief medical officer for Atlanta United, coordinating a team of physicians committed to providing the highest level of orthopedic care to its players on the field.” Dr. Symbas is well prepared for this role, having previously served as the team physician for the Atlanta Silverbacks professional soccer team and Pace Academy, a preparatory school in Atlanta. He played competitive soccer at the collegiate level serving as captain of the nationally ranked Emory University men’s soccer team. Dr. Symbas sees patients at OrthoAtlanta offices including Piedmont West, Marietta and Kennesaw. Dr. Symbas is the Chief of Orthopaedics for the Piedmont Clinic. He has also served as the Chairman of the Department of Orthopedics for Piedmont Atlanta Hospital. As the chief medical officer for Atlanta United, I am proud to be coordinating a team of physicians committed to providing the highest level of orthopedic care to its players on the field. 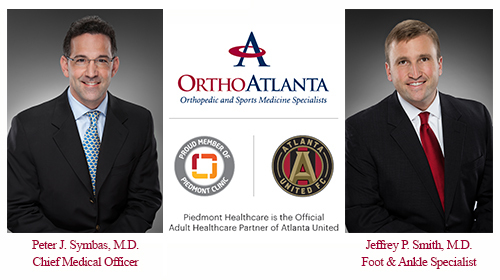 OrthoAtlanta orthopedic surgeon, Jeffrey P. Smith, MD, serves on the Atlanta United 2 medical team as a Foot & Ankle Specialist. Fellowship-trained in foot and ankle surgery, Dr. Smith serves patients at OrthoAtlanta offices in Johns Creek and Gwinnett. OrthoAtlanta is one of the largest physician-owned orthopedic and sports medicine practices in the greater Atlanta, Georgia area providing an integrated approach to musculoskeletal care. With 39 physicians serving in 14 offices, and 450 employees, the practice is dedicated to providing the highest level of patient care for injury or deformity of muscles, joints, bones, and spine. Comprehensive operative and non-operative musculoskeletal care and expertise include sports medicine, arthroscopic surgery, hip replacement, knee replacement, neck and spine surgery, elbow and shoulder surgery, hand and wrist surgery, foot and ankle surgery, pain management, arthritis treatment, general orthopedics, work related injuries and acute orthopedic urgent care. OrthoAtlanta patient services including on-site physical therapy, seven MRI imaging centers, and workers’ compensation coordination. OrthoAtlanta Surgery Centers in Austell and Fayetteville provide cost-effective, same-day surgical procedures in an accredited outpatient center. Dedicated to the Atlanta community, OrthoAtlanta proudly serves as the official sports medicine provider to many premier sports teams and events, including the Chick-fil-A Peach Bowl, Chick-fil-A Kickoff Game, BB&T Atlanta Open tennis, Atlanta Gladiators professional hockey, Clayton State University, and numerous high school and community sports programs across the region. Learn more at www.OrthoAtlanta.com. Atlanta United joined Major League Soccer in 2017 and became just the fourth expansion team in league history to qualify for MLS Cup Playoffs. The club set multiple league records including season tickets sales (36,000-plus), single-game attendance (71,874), single-season average (48,200) and total home attendance (819,404). Owned by one of the city’s most influential businessmen and philanthropists, Arthur M. Blank, and led by club President Darren Eales, Atlanta United plays its home matches at Mercedes-Benz Stadium. For more information about Atlanta United, including how to purchase season tickets, visit: www.atlutd.com, and follow @ATLUTD. A private, not-for-profit organization serving nearly 2 million patients across Georgia, Piedmont is transforming healthcare, creating a destination known for the best clinicians and a one-of-a-kind experience that always puts patients first. Today, more than 110 years since it was founded, Piedmont is known as a leading health system in cancer care, treatment of heart disease and organ transplantation with 11 hospitals, 24 urgent care centers, 28 Piedmont QuickCare locations, 555 Piedmont Clinic physician practice locations and more than 2,000 Piedmont Clinic members. Our 22,000-plus employees dedicate themselves to making a positive difference in every life we touch, and our commitment doesn’t stop there. In FY 2017, Piedmont provided more than $215 million in uncompensated care community benefit programming in an effort to better the health and well-being of the people in the communities we serve. For more information, visit piedmont.org.